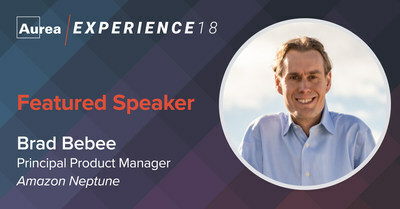 AUSTIN, Texas, Oct. 30, 2018 /PRNewswire/ -- Aurea Software, the company behind some of the world's greatest customer and employee experience solutions, including Jive Software, today announced that Brad Bebee, principal product manager at Amazon Web Services (AWS), will keynote at Aurea Experience 18 on November 12 in Munich and December 4 in New Orleans. Alongside Aurea CEO Scott Brighton, Bebee will explore how companies like Aurea are leveraging Amazon Neptune, a fast, reliable, fully managed graph database service that makes it easy to build and run applications that work with highly connected data sets. At Aurea Experience 18, Brighton will unveil details of the massively scalable PeopleGraph technology Aurea is building on Amazon Neptune. Aurea's new PeopleGraph will take relationship ntelligence to an unprecedented level of sophistication to support enterprise communities centered around people. This underlying platform will eventually span Aurea's entire software library to help businesses uncover and enrich different types of relationships inside and outside their organization. Aurea Experience 18 spans two free events in Europe and North America, where Aurea customers and partners will enjoy three informative tracks with more than 15 breakout sessions on employee engagement, the new digital workplace and customer intelligence. Speakers include more than a dozen customers from organizations such as American Airlines, Carlson Wagonlit Travel, Citi, Commvault, International Committee of the Red Cross, Lloyds Banking Group, Morgan Stanley, Pearson, Schaeffler, Vodafone Ukraine and more. In addition, the conference will offer a "boot camp" track, where Jive community managers can learn key skills, strategies and best practices for building strategic plans, increasing adoption and driving advanced community use cases. For more information, follow @AureaSoftware and #AureaExperience on Twitter.